Regardless of how bad Notre Dame lost on Saturday, much of this season has been a success, especially the turnaround of a program that went 4-8 last year and will finish with more than twice their win total and a chance of 10+ wins. With a trio of new coordinators in Chip Long, Mike Elko, and Brian Polian and a revamped strength and conditioning program led by Matt Balis, the team has been impressive for much of the season and a year ahead of schedule in their latest rebuilding process. With the developments made on and off the field, elite recruits have taken notice and have made it a point of emphasis to take a closer look at Notre Dame. This weekend against Navy will be a bigger recruiting weekend than anticipated. 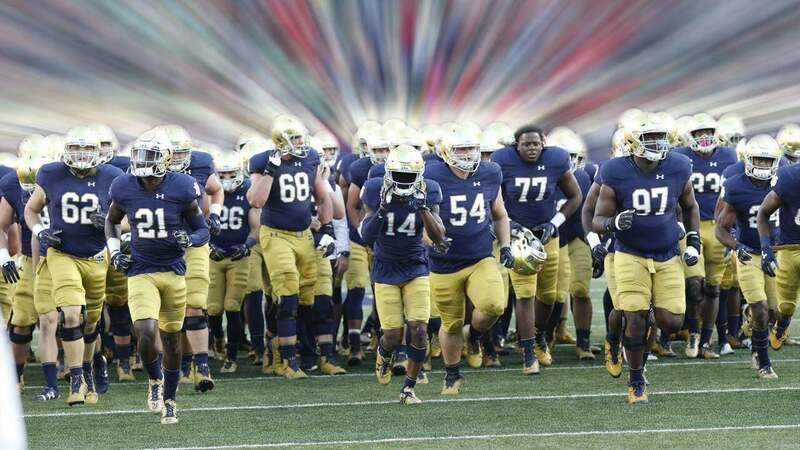 Being Senior Day, and the last home game of the season, this is the last chance to host a recruit for a game-day visit and experience Notre Dame on a football Saturday. The next time a recruit will be able to visit campus is on December 9th for the Echoes football banquet. With that said, there will be a sense of urgency of getting as many recruits on campus as possible this weekend in order to put a bow on the 2018 recruiting class as well as make a strong impression for the 2019 recruits which they have already begun to identify their top of the board targets. The only 2018 recruit that will be having an official visit this weekend is four-star outside linebacker Payton Wilson from North Carolina. Wilson is an elite prospect with an extremely high ceiling who is currently ranked as the 68th overall player according to the 247Sports Composite Rankings and #3 outside linebacker. The staff is looking to add another elite player at linebacker to complement an already talented group of commits which include Shayne Simon (131st overall), Jack Lamb (139th overall), Matthew Bauer (240th overall), and Ovie Oghoufo (389th overall). Wilson would give the Irish a lot of talent and depth in this class and would allow the staff to move personnel around and possibly convert one of their linebackers to defensive end, a position that they have under-recruited this year. The story behind Wilson is that he has been committed to UNC since May, but the year that UNC have had has shaken up his confidence in the program. He is very much a Carolina boy and many pencil him to stay home at UNC or NC State, so the fact that Notre Dame have been able to get a visit from him has been huge. Another 2018 recruit who will make his way to campus is tight end Tommy Tremble from Norcross, Georgia. Tremble is rated as the 508th overall player and #23 tight end in the class and is someone who is seen by the staff who could provide the perfect complement to Notre Dame commit George Takacs (254th overall) who provides more of an athletic/receiving threat as opposed to Takacs who is much bigger and physical. Tremble has been on campus multiple times before and is coming on an unofficial visit, paying his expenses out of his own pocket, showing how serious his interest in Notre Dame is. Notre Dame at this point are heavy favorites to land him in this class and it would be surprising if he doesn’t announce for the Irish sooner rather than later. As is the case with most successful seasons, they tend to have a greater impact on the junior class than the seniors. Most elite seniors already have made up their mind of where they will attend and are firmly entrenched in their commitments. The juniors on the other hand are still in the evaluative process and much more receptive to the program’s recent success. With defensive tackle Jacob Lacey (154th overall) and quarterback Cade McNamara (376th overall) already in the class, they already have a solid platform to build on. Notre Dame has been making headway in recruiting defensive linemen. The first major 2019 defensive lineman that will be on campus is Murfreesboro, Tennessee four-star defensive end Joseph Anderson. While not the highest rated visitor that will be on campus, Anderson is ranked as the 91 overall prospect and 8th ranked strong-side end in his class. Anderson may be the most important of the visitors this weekend as he may be the next to commit to this class. Having visited Notre Dame multiple times already and having a close built a really close relationship with current commit Jacob Lacey over their recruitment to Notre Dame, Anderson and his father have been openly pro-Irish and may commit soon. The highest rated player that will be on campus is five-star defensive end Zach Harrison from Lewis Center, Ohio. Just like Lacey and Anderson, Harrison is also very interested in the Irish, having made previous trips to campus himself, but being an Ohio native it would be tough for Notre Dame to pull the 4th overall player of the 2019 class out of state. Fortunately, the Irish will also be hosting four-star 2019 defensive end Rodas Johnson as well. Despite being from Columbus, Ohio, Johnson who is the 210th player overall isn’t as heavily recruited by the hometown Buckeyes and is currently an early favorite to land at Notre Dame. Sticking with the Ohio theme, four-star 2019 linebacker Cade Stover will be making his first trip to campus this weekend. Stover is currently the 92nd overall player in the 2019 class and is currently a heavy favorite to commit to the in-state Buckeyes. With this visit, the Irish are looking to get in the mix with Ohio State and Penn State who are currently ahead. Another four-star linebacker that Notre Dame is looking at is Casey Kline from Brawley, California. Kline is an exceptional two-way athlete who recently committed to the Arizona Wildcats in late October and plays the wildcat quarterback role in his offense in addition to his linebacking duties. Despite the commitment, Kline who is ranked as the 260th overall and is Irish Catholic himself, grew up in a Notre Dame football household and always wanted to get out to South Bend. His recruitment to Notre Dame can escalate quickly if offered as he acknowledged that it would be a game changer. Notre Dame will also look to make an impression on four-star offensive tackle John Olmstead of Metuchen, New Jersey. Olmstead is ranked as the 140th overall player of the 2019 class and Notre Dame is already an early favorite to land him. With the current 2018 offensive line class appearing to be small, the staff are looking to make up for it in 2019. Notre Dame will also host the top-rated prospect from Kansas in four-star weakside end Marcus Hicks. Hicks, who currently doesn’t have an offer from the Irish is the 240th overall player in 2019 and could come away with a Notre Dame offer and added to the big board of the previously mentioned defensive linemen. Finally, another recruit that was expected to make the trip this weekend is 2018 wide receiver Lawrence Keys III from New Orleans, Louisiana. Keys who is ranked as a four-star prospect and 225th overall player in this class has always had Notre Dame high on his board and it was rumored that he told current Notre Dame commit Kevin Austin that the Irish were his favorite as recently as two weeks ago. Keys would fit as Notre Dame’s lone slot receiver in this class and would give Notre Dame another weapon in the passing game. Whether he will be on campus or not this weekend hasn’t been confirmed, but a visit would put the Irish in a great place to lure him away from in-state LSU. Notre Dame's Top Pass Rushing Prospect, Already Committed?